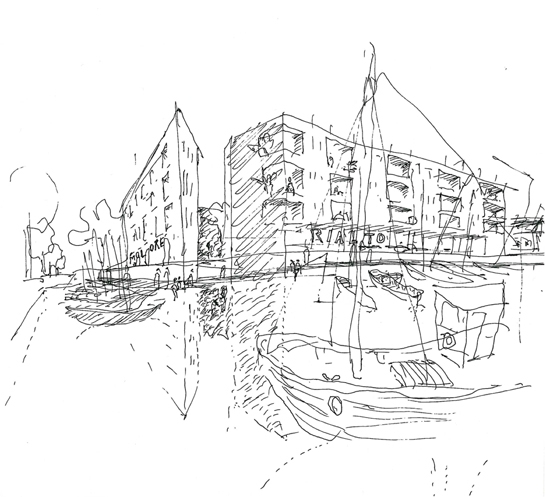 The proposal by Johan Celsing Arkitektkontor was selected in a limited competition with Lundegaard Tranberg Architects, Copenhagen and Fojab Architects, Malmö. The competition was arranged jointly by the Landskrona Municipality and the Swedish developer JM. The project will contain some 80 apartments in a prime location opposite of the Sofia Albertina church of 1767. The site is also facing the Town-hall and the canals of the city, that until recently was used for the ferries to Copenhagen and the island of Ven. A robuste, almost square block, is proposed with facacde of yellow bricks. A new canal makes it possible to use a boat all the way into the courtyard. The proposed miniature-park towards the church is designed as a \"parterre de broderie.\"